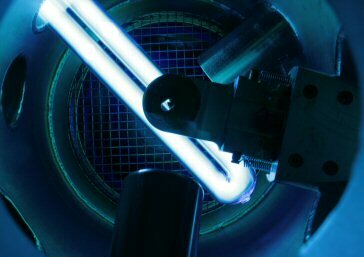 RBD's desorption products utilize shortwave IR, and UVC radiation to desorb layers of water vapor in vacuum chambers without the intense heat of IR or a radiant bake-out. Using UVC to desorb water vapor is ideal for chambers that have Viton O-ring seals, which pump down in the range of the low 10-6 to low 10-7 Torr. Benefits include faster pump down times and a lower ultimate vacuum. For more information on water vapor and it's effects on vacuum chambers, please see this collection of articles (compiled by Normandale Community College) by the late Phil Danielson (formally of The Vacuum Lab). The UVB uses UVC radiation to desorb water vapor without heat. The emitter extends into the vacuum chamber. The UVB-100 comes standard with 2.75 CF or NW40 (K150) KF mount. Other flange mounts are available on request. The mini-Z is ideal for solving water vapor problems in compact vacuum chambers such as the Kimball Physics Multi-CF line of spherical chambers, mini ALD chambers, pressure cells and load locks. The mini-Z power supply is simple to use – just turn it on! A remote ON/OFF option is available if you want to operate the miniZ by a process controller or set point. The IRB series is designed for systems that can take the heat of shortwave IR. 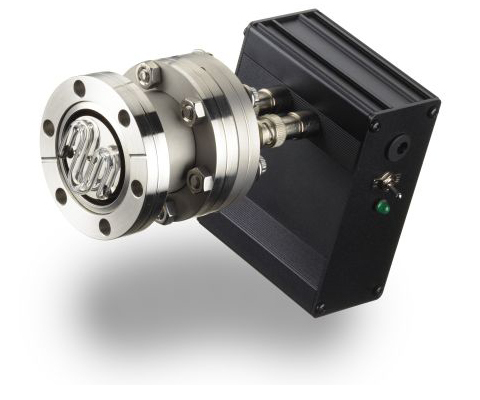 It provides an easy way to bake-out X-ray photoelectron and Auger spectrometers systems out without the need to remove optics cables or realign the analyzer focal point. Variac: control the amount of heat by turning up the knob on the Variac. You can set it so that the chamber walls nearest the lamp do not exceed 150C and then leave it on over the weekend for a simple and easy bake-out.